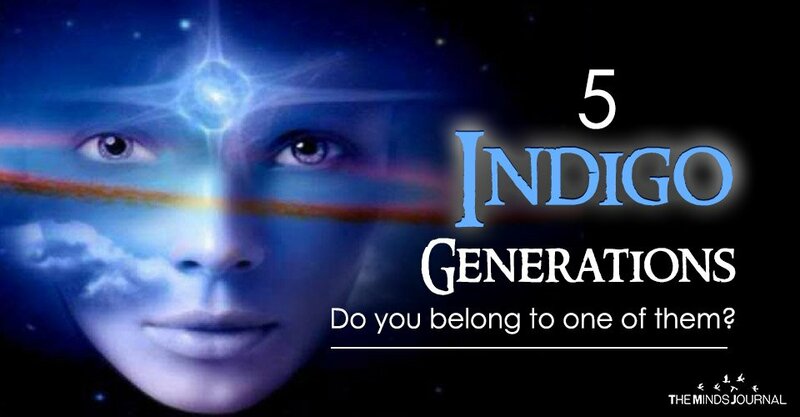 The 5 Indigo Generations - Do you belong to one of them? To say that Indigo people just materialized on Earth in the recent years would be wrong. Their manifestation is not a recent phenomenon at all and they have been on this planet for a long time indeed. Having said that; it is also true that their numbers haven’t seen such a surge in quite some time. The Blue Ones, as the people of the Indigo Ray are also called, were always on this planet, but they were always only a handful of them around. That changed as soon as the twentieth century began to draw towards its close. But one thing is certain, no matter how rare or far in between these people have manifested on earth, they have always been an integral part of humanity’s progress. They have guided the world in the form of leaders and innovators, and whether or not they gained much recognition, they were always present. This is the generation which manifested between the years 1958-1968. These were the people with blue-violet-green overlays when they were born, along with tan’s camouflaged. For them, the years of awakening, i.e. those of Saturn’s return were 1986-1996. Approximately at 28 years of age. Therefore, it is quite clear that presently they have reached an age of post-awakening. This is the time for them to rediscover and recover the gifts they have lost. Some of them have also reached the stage where they will transition into the Octarine phase. This generation was born between the periods spanning from 1968-1978. They were born with the same overlays as the ones before them, i.e. – blue-violet-green. The only difference is that these overlays were not accompanied by the tan camouflage. Also for them, the years of awakening (i.e. Saturn’s return) was between 1996 and 2006. Therefore, naturally, they too are in the years of their post-awakening. This generation was born between the years 1978-1988. They are quite different from the two generations that preceded them because they have very few overlays, if at all. Even in the case of an overlay, there isn’t much variety and it is most probably violet. Crystal or Octarine might also occur but the probability is very less. This generation is unique in other ways too. This is the first generation to witness, what came to be referred to as the early occurrences of ADHD and ADD amongst the Blue ones in their childhood phase. The duration for this generation’s awakening or Saturn’s return is between the years 2006 to 2016. This generation of Indigo people was born between the years 1988 to 1998. They are considered the pure ones or the pure indigos because they have absolutely no overlay at all. Just the crystal or octarine overlay in some cases which are anyway considered chameleonic colors. Among all the Indigos, these are the wildest on the ADD/ADHD spectrum. One of the speculations regarding this increasingly distracting behavior on the part of this generation of Indigos is that the media hyperactivity in the last decade of the twentieth century might have acted upon their overlays which led to this. The crystal element in their overlay needs to be grounded, and overstimulation by drugs and the likes would only make things worse. It is rather suggested to use warm and deep colors in their everyday environment, in addition to slow rhythms. These will help to soothe and calm the indigo child, which is very vital especially because he/she usually finds themselves in an environment which is overstimulated and full of flashy lights and noises. If these measures are not taken, their adolescence (which is already harder than any other group) would be very difficult to maneuver and might see a lot of drug abuse, suicides and what not. For this group, the years of Saturn’s return are between 2016 and 2026.